This is a guest blog from Robin Moffatt. Robin Moffatt is Head of R&D (Europe) at Rittman Mead, and an Oracle ACE. His particular interests are analytics, systems architecture, administration, and performance optimization. This blog is also posted on the Rittman Mead blog, read it here. 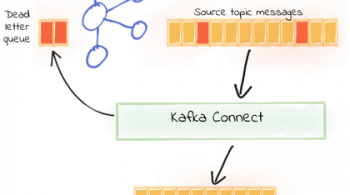 The Connect API in Kafka is part of the Confluent Platform, providing a set of connectors and a standard interface with which to ingest data to Apache Kafka, and store or process it the other end. Initially launched with a JDBC source and HDFS sink, the list of connectors has grown to include a dozen certified connectors, and twice as many again ‘community’ connectors. These cover technologies such as MongoDB, InfluxDB, Kudu, MySQL – and of course as with any streaming technology, twitter, the de-facto source for any streaming how-to. Two connectors of note that were recently released are for Oracle GoldenGate as a source, and Elasticsearch as a sink. 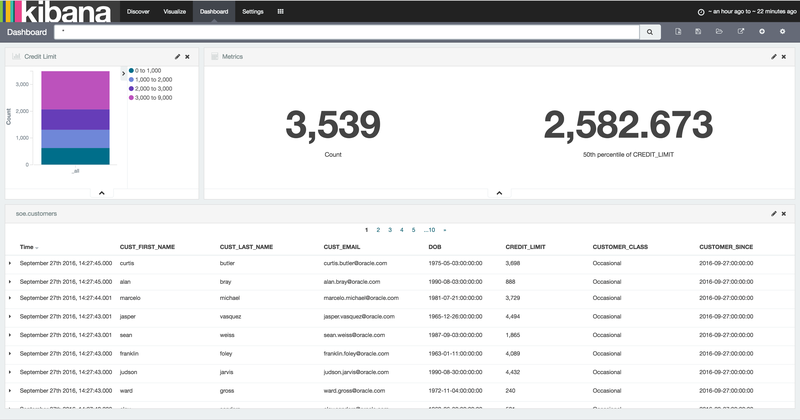 In this article I’m going to walk through how to set these up, and demonstrate how the flexibility and power of the Kafka Connect platform can enable rapid changes and evolutions to the data pipeline. Oracle GoldenGate (OGG) is a realtime data replication tool, falling under the broad umbrella of Change Data Capture (CDC) software, albeit at the high end in terms of functionality. It supports multiple RDBMS platforms, including – obviously – Oracle, as well as DB2, MySQL, and SQL Server. You can find the full certification list here. It uses log-based technology to stream all changes to a database from source, to target – which may be another database of the same type, or a different one. It is commonly used for data integration, as well as replication of data for availability purposes. In the context of Kafka, Oracle GoldenGate provides a way of streaming all changes made to a table, or set of tables, and making them available to other processes in our data pipeline. These processes could include microservices relying on an up-to-date feed of data from a particular table, as well as persisting a replica copy of the data from the source system into a common datastore for analysis alongside data from other systems. Elasticsearch is an open-source distributed document store, used heavily for both search, and analytics. 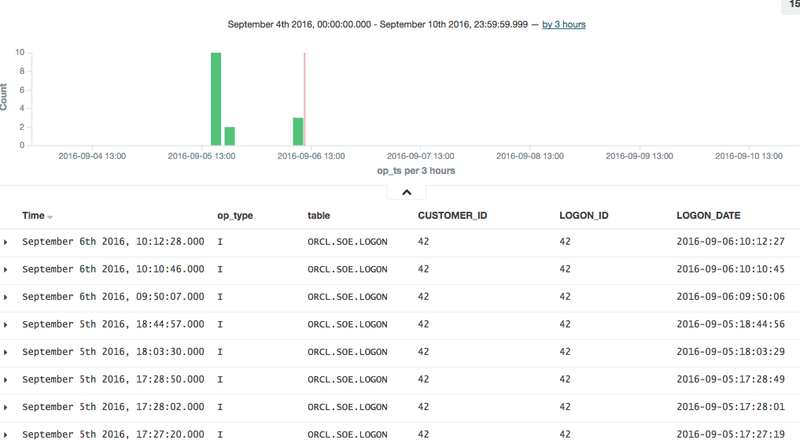 It comes with some great tools including Kibana for data discovery and analysis, as well as a Graph tool. Whilst Elasticsearch is capable of being a primary data store in its own right, it is also commonly used as a secondary store in ordier to take advantage of its rapid search and analytics capabilities. It is the latter use-case that we’re interested in here – using Elasticsearch to store a copy of data produced in Oracle. 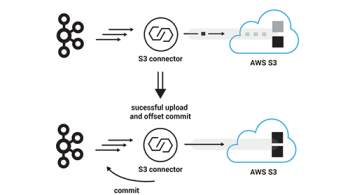 Confluent’s Elasticsearch Connector is a source-available connector plug-in for the Connect API in Kafka that sends data from Kafka to Elasticsearch. It is highly efficient, utilising Elasticsearch’s bulk API. It also supports all Elasticsearch’s data types which it automatically infers, and evolves the Elasticsearch mappings from the schema stored in Kafka records. Requires less resource on the source database, since OGG mines the transaction log instead of directly querying the database for changes made based on a timestamp or key. Scales better, since entire schemas or whole databases can be replicated with minimal configuration changes. The JDBC connector requires each table, or SQL statement, to be specified. Note that Oracle Golden Gate for Big Data also has its own native Kafka Handler, which can produce data in various formats directly to Kafka (rather than integrating with the Kafka Connect framework). I’m using the Oracle BigDataLite VM 4.5 as the base machine for this. It includes Oracle 12c, Oracle GoldenGate for Big Data, as well as a CDH installation which provides HDFS and Hive for us to also integrate with later on. To generate the schema and continuous workload, I used Swingbench 2.5. For a step-by-step guide on how to set up these additional components, see this gist. There are three processes that need starting up, and each retains control of the session, so you’ll want to use screen/tmux here, or wrap the commands in nohup [.. command ..] & so that they don’t die when you close the window. If it isn’t running, then start it with sudo service zookeeper-server start. Oracle GoldenGate (OGG) works on the concept of an Extract process which reads the source-specific transaction log and writes an OGG trail file in a generic OGG format. From this a Replicat process reads the trail file and delivers the transactions to the target. In this example we’ll be running the Extract against Oracle database, specifically, the SOE schema that Swingbench generated for us – and which we’ll be able to generate live transactions against using Swingbench later on. The Replicat will be sending the transactions from the trail file over to Kafka Connect. I’m assuming here that you’ve already successfully defined and set running an extract against the Swingbench schema (SOE), with a trail file being delivered to /u01/ogg-bd/dirdat. For a step-by-step guide on how to do this all from scratch, see here. You can find information about the OGG-Kafka Connect adapter in the README available as part of the download. To use it, first configure the replicat and supporting files as shown. Handler configurationEdit the existing /u01/ogg-bd/dirprm/conf.props and amend gg.classpath as shown below. The classpath shown works for BigDataLite – on your own environment you need to make the necessary jar files available per the dependencies listed in the README (available as part of the download). Note the gg.log.level setting – this can be very useful to switch to DEBUG if you’re investigating problems with the handler. Kafka Connect settingsEdit the existing /u01/ogg-bd/dirprm/confluent.properties and amend the schema.registry.url URL to reflect the port change made above. All other values can be left as defaults. 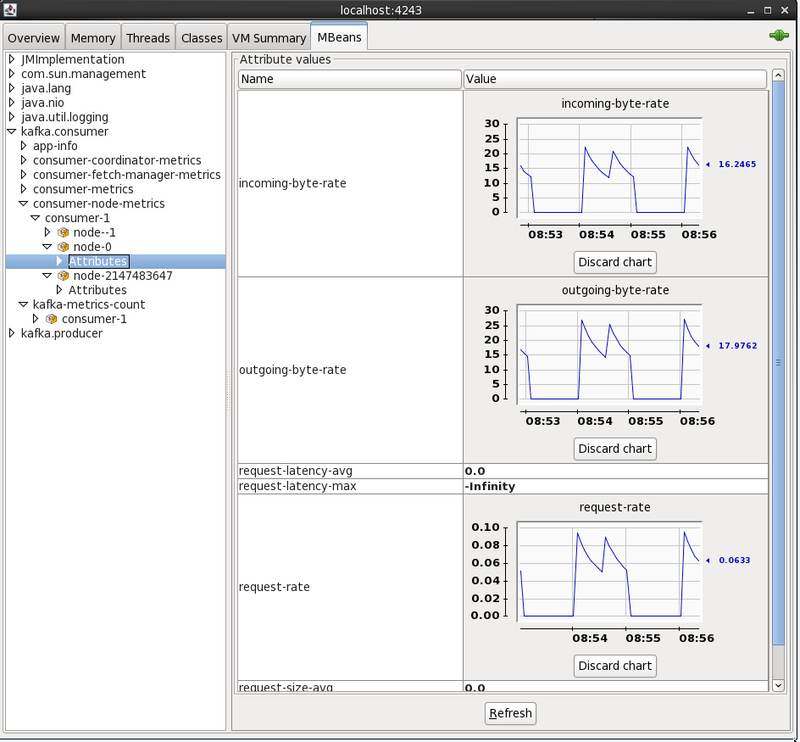 Note that on BigDataLite 4.5 VM there are two existing replicats configured, RKAFKA and RMOV. You can ignore these, or delete them if you want to keep things simple and clear. We’ll run Swingbench in a moment to generate some proper throughput, but let’s start with a single transaction to check things out. Hit Ctrl-C to cancel the consumer — otherwise it’ll sit there and wait for additional messages to be sent to the topic. Useful for monitoring when we’ve got lots of records flowing through, but not so useful now. So we’ve got successful replication of Oracle transactions into Kafka, via Oracle GoldenGate. Now let’s bring Elasticsearch into the mix. We’re going to use Elasticsearch as a destination for storing the data coming through Kafka from Oracle. Each Oracle table will map to a separate Elasticsearch index. 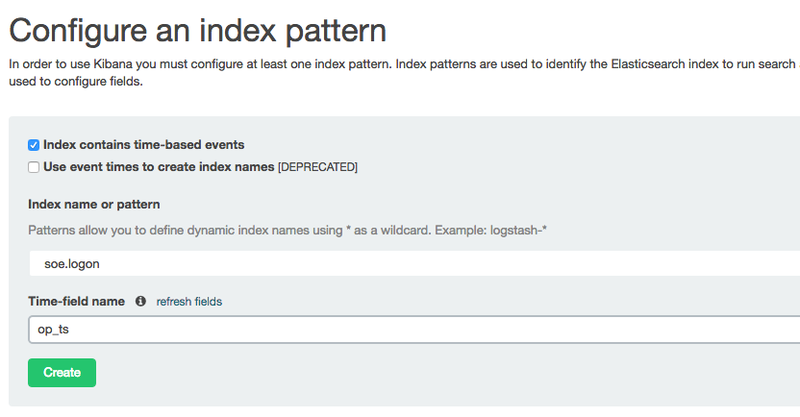 In Elasticsearch an ‘index’ is roughly akin to an RDBMS table, a ‘document’ to a row, a ‘field’ to a column, and a ‘mapping’ to a schema. Note that this wouldn’t suffice for a Production deployment, in which you’d want to allocate heap space, check open file limits, configure data paths, and so on. From Kopf you can see which nodes there are in the Elasticsearch cluster (just the one at the moment, with a random name inspired by Marvel), along with details of the indices as they’re created – in the above screenshot there are none yet, because we’ve not loaded any data. Create a configuration file for the Elasticsearch Kafka Connect API handler. I’ve put it in with the Elasticsearch configuration itself at /opt/elasticsearch-2.4.0/config/elasticsearch-kafka-connect.properties; you can use other paths if you want. Note that the global key.ignore is currently ignored if you are also overriding another topic parameter. If you don’t set this flag for the topic, you’ll get org.apache.kafka.connect.errors.DataException: STRUCT is not supported as the document id..
Now we can run our connector. I’m setting the CLASSPATH necessary to pick up the connector itself, as well as the dependecies. 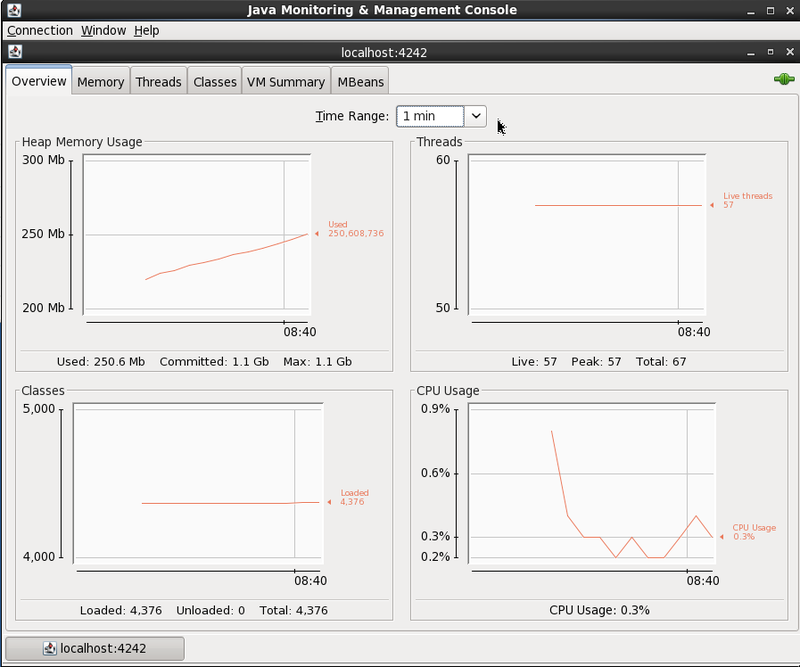 I also set JMX_PORT so that the metrics are exposed on JMX for helping with debug/monitoring. In addition the header bar of Kopf has gone a yellow/gold colour, because your Elasticsearch cluster is now in “YELLOW” state – we’ll come back to this and the cause (unassigned shards) shortly. [oracle@bigdatalite ~]$ curl -s -X "GET" "http://localhost:9200/soe.logon/_count?pretty=true"
$ curl -s -X "GET" "http://localhost:9200/soe.logon/_search?pretty=true"
This is looking good! But … there’s a wrinkle. 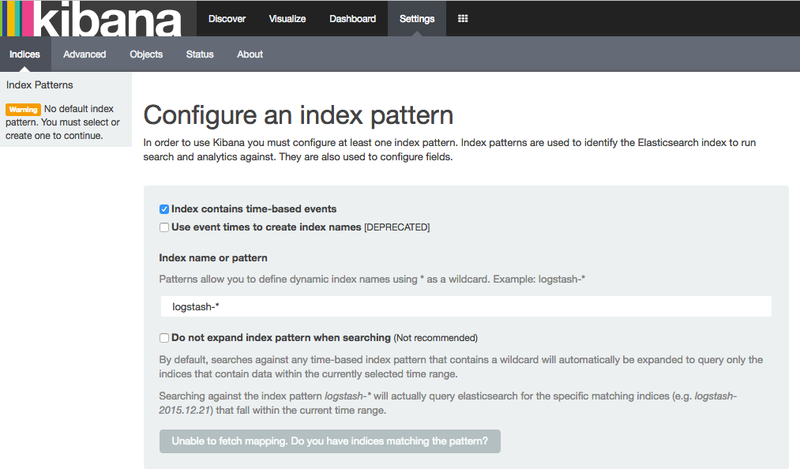 Let’s fire up Kibana, an analytical tool for data in Elasticsearch, and see why. This string-based schema is actually coming through from the OGG replicat itself – whilst the Connect API handler interprets and assumes the datatypes of columns such as numbers, it doesn’t for timestamps. 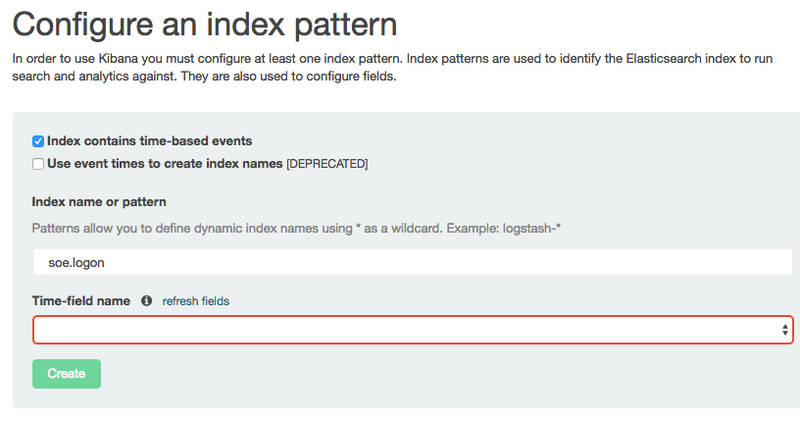 So – how do we fix these data types in Elasticsearch so that we can make good use of the data? EnterDynamic Templates. These enable you to specify the mapping (similar to a schema) of an index prior to it being created for a field for the first time, and you can wildcard field names too so that, for example, anything with a _ts suffix is treated as a timestamp data type. 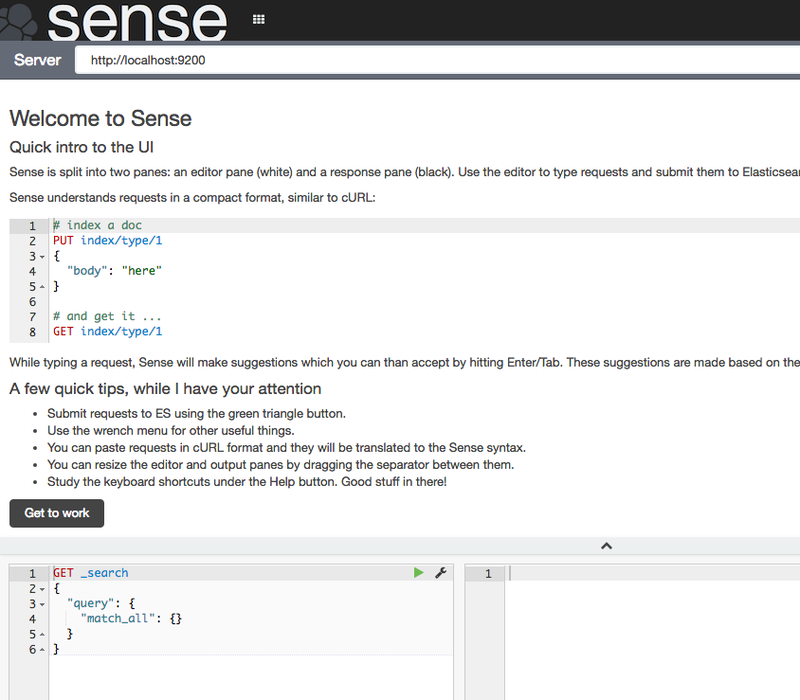 To configure the dynamic template we’ll use the REST API again, and whilst curl is fine for simple and repeated command line work, we’ll switch to the web-based Elasticsearch REST API client, Sense. Assuming that you installed it following the process above you can access it at http://<server>:5601/app/sense. The DELETE is just there so that you can re-run these statements, since Elasticsearch won’t update an existing template. This is based on a single-node Elasticsearch instance, so setting the number of replicas to zero, and shards to one. In a multi-node Production cluster you’d want to set these differently. If you leave replicas as the default (1) then your Elasticsearch cluster will remain in “YELLOW” health status as there’ll forever be unassigned shards. The non_analysed_string_template template matches any string field and creates two instances of it; one analyzed and one not. Analyzed is where it gets tokenized which is useful for full-text searching etc, and non-analyzed is necessary for aggregations against the full field value. For example, “New York” would otherwise aggregate as ‘New’ and a separate instance ‘York’. Put the cursor over each statement and click the green play arrow that appears to the right of the column. Now we’ll delete the index itself so that it can be recreated and pick up the dynamic mappings. Here I’m using curl but you can run this in Sense too if you want. $ curl -X "DELETE" "http://localhost:9200/soe.logon"
Watch out here, because Elasticsearch will delete an index before you can say ‘oh sh….’ — there is no “Are you sure you want to drop this index?” type interaction. You can even wildcard the above REST request for real destruction and mayhem – action.destructive_requires_name can be set to limit this risk. So, to recap – we’ve successfully run Kafka Connect to load data from a Kafka topic into an Elasticsearch index. We’ve taken that index and seen that the field mappings aren’t great for timestamp fields, so have defined a dynamic template in Elasticsearch so that new indices created will set any column ending _ts to a timestamp. Finally, we deleted the existing index so that we can use the new template from now on. If you’re running Kafka Connect in standalone mode then you could also just delete the offsets file to achieve the same. $ curl -X "GET" "http://localhost:9200/soe.logon/_mapping?pretty"
Note that the two timestamp columns are now date type. If you still see them as strings, make sure you’ve set the topic.schema.ignore configuration as shown above in the Kafka Connect properties for the Elasticsearch connector. Looking at the row count, we can see that all the records from the topic have been successfully replayed from Kafka and loaded into Elasticsearch. This ability to replay data on demand whilst developing and testing the ingest into a subsequent pipeline is a massive benefit of using Kafka! Note that the Time-field name field is now populated. I’ve selected op_ts. Click on Create and then go to the Discover page (from the option at the top of the page). You may well see “No results found” – if so use the button in the top-right of the page to change the time window to broaden it to include the time at which you inserted record(s) to the SOE.LOGON table in the testing above. In this example you can see that there was quite a few testing records inserted (op_type = I), with nothing changing between than the LOGON_DATE. 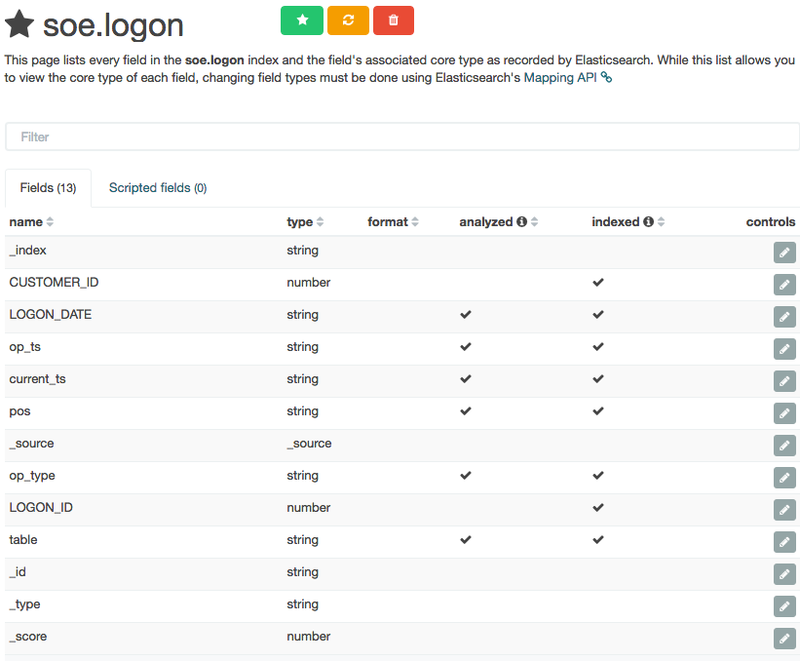 then check the Elasticsearch log/stdout, where you’ll find more details. This kind of thing that can cause problems would be an index not deleted before re-running it with the new template, as well as a date format in the template that doesn’t match the data. If you’ve made it this far, congratulations! Now we’re going to set up the necessary configuration to run Swingbench. This will generate a stream of changes to multiple tables, enabling us to get a feel for how the pipeline behaves in ‘real world’ conditions. Having created the configuration, run the connector. If the previous connector from the earlier testing is running then stop it first, otherwise you’ll get a port clash (and be double-processing the ORCL.SOE.LOGONtopic). Each of the columns with abbreviated headings are different transactions run, and as soon as you see numbers above zero in them it indicates that you should be getting data in the Oracle tables, and thus through into Kafka and Elasticsearch. But, this includes the records that were pre-seeded by Swingbench before we set up the OGG extract. How do we know how many have been read by GoldenGate since, and should therefore be downstream on Kafka, and Elasticsearch? Enter logdump. This is a GoldenGate tool that gives a commandline interface to analysing the OGG trail file itself. You can read more about it here, here, and here. Here we can see that there are a total of 45 insert/update records that have been captured. Looks good – a total of 45 records again. Since the console consumer process is still running in the background (type fg to bring it back to the foreground if you want to cancel it), you can re-issue the wc as required to see the current count of messages on the topic. Here we’ve proved that the number of records written by Oracle are making it all the way through our pipeline. Kafka and Kafka Connect expose metrics through JMX. There’s a variety of tools for capturing, persisting, and visualising this, such as detailed here. For now, we’ll just use JConsole to inspect the metrics and get an idea of what’s available. 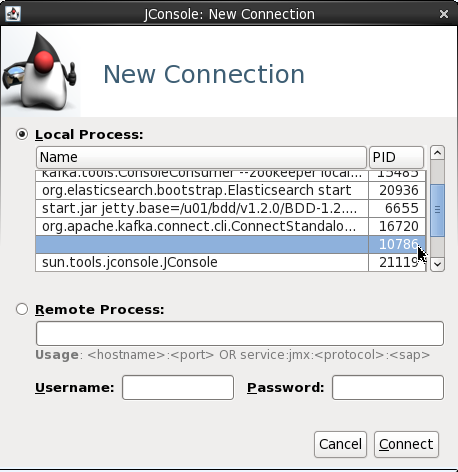 From here I connected to the ‘Remote Process’ on localhost:4243 to access the Kafka server process (because it’s running as root the jconsole process (running as a non-root user) can’t connect to it as a ‘Local Process’). The port 4243 is what I specified as an environment variable as part of the kafka process launch. By default when you see an attribute for an MBean is it point-in-time – doubleclick on it to make it a chart that then tracks subsequent changes to the number. 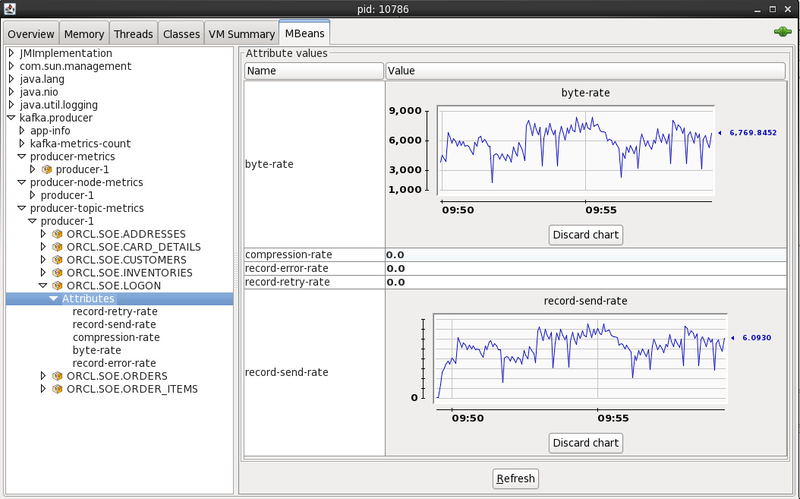 Then select that PID from the JConsole connection list – note that the process name may show as blank. In this article we’ve seen how to stream transactions from a RDBMS such as Oracle into Kafka and out to a target such as Elasticsearch, utilising the Kafka Connect platform and its standardised connector framework. We also saw how to validate and audit the pipeline at various touchpoints, as well as a quick look at accessing the JMX metrics that Kafka provides. Is there a way to set the message key to the value (or a concatenation of values) of a record’s primary key so that all messages for a specific record go to the same partition? very good article. Is there a way to send init data to Kafka, not just new records? Excellent article and I got through it with almost no issues. Thanks. 1. You didn’t have any instructions on installing rlwrap and it’s not there by default – I looked at Tim’s site for those: https://oracle-base.com/articles/linux/rlwrap which worked out fine. 2. At the end when you’re doing the jconsole to connect and show the JMX metrics you talk of port 4242 but earlier in the article you’ve set the JMX port to 4243 which was still the case for me. It therefore failed for port 4242 but worked fine on 4243. 3. For a second I didn’t understand why I saw nothing on the JMX metrics…until I started swingbench to put some load to actually see – doh! Very useful considering Confluent is in the mix at my current client. I’ve fixed the 4243/4242 reference. Downloaded confluent version 4. 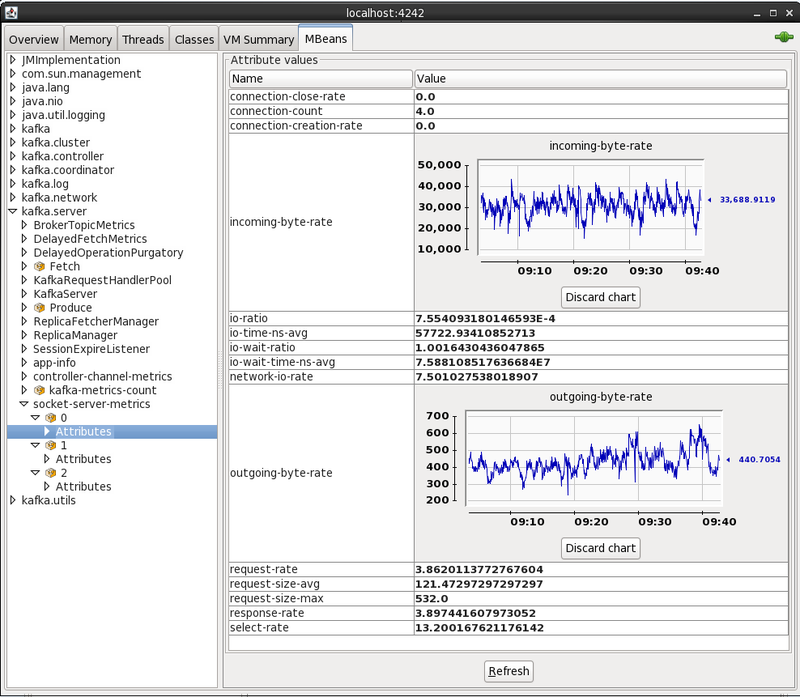 Installed Oracle Gateway 12.3.1.1 for big data on ORacle Linux 7. 2018-01-22T16:12:36.070+0200 ERROR OGG-01668 Oracle GoldenGate Delivery, test.prm: PROCESS ABENDING. Looks like a problem with your OGG-BD installation/config. See if this helps, as the process has changed since that original article was written. It is possible create multiple topic and send data into different topic ? all the data needs to go in one topic only ? Check out the doc here – you can use gg.handler.name.topicMappingTemplate to define which topic(s) you want to write to. Golden gate is licensed version,can you please help me with opensource CDC tool? It depends what your source database is as to specific CDC tools. This article lists all the CDC tools that integrate well with Confluent Platform. I sucessfully imported the Oracle vm and installed confluent and kafka connect handler. After that i tried executing ogg and oggbd for a extract and replicate process. * This is an error in the GG Kafka Connect handler, so you might also want to check on the Oracle forums too.